In terms of photography, we already know there is GIMP as the best open source alternative to Photoshop. What about Lightroom? Lightroom is another Adobe’s popular product. It’s a versatile tool which you can use as a photo management as well RAW processor. Same as Photoshop, Lightroom is also exclusively only available for Windows and Mac. No Linux. There are a bunch of Lightroom alternatives you can install and use on your Linux computer. Darktable is one of which. Without any aim of underestimating other tools, Darktable is by far the best open source alternative to Lightroom. First, the tool has a similar interface to Lightroom. Second, it is also capable of organizing your images — be it RAW or JPG — as well as making adjustments like adjusting the exposure, white balance so on. Darktable can also be used as a bridge that connects your computer and camera. 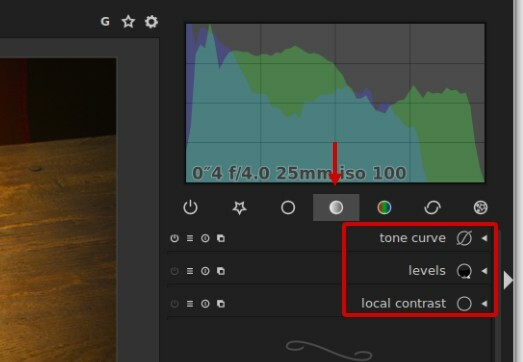 The concept of Darktable is also the same as Lightroom. You can fix your images by adjusting certain parameters whereby the changes can be displayed in a real-time, but they (the changes) won’t really be applied until you export concerned images. It’s because of Darktable is non-destructive image editor. What is non-desctructive? It’s a mechanism of image editing that won’t affect the original images you are editing. In other words, whatever the changes you made, the original images remain the same. Darktable accesses your images “read-only” and the changes you made will be saved in .xmpfiles. That is why you will see .xmpfiles in the folders of the images you have opened with Darktable. Those files store the edit info you have made on each image. Is Darktable only available for Linux? No. Darkable is a cross-platform tool. In addition to Linux, it is also available for Windows and macOS. It’s an ideal option if you are just a photography hobbyist since you don’t need to buy it to be able to use it. You can download the binary files of Darkable on its official site. The very first thing you need to do before being able to use Darkable is to learn its interface. Darkable comes with a dominant black interface, just like Lightroom. You will see 6 main menus at the upper right-corner of the Darktable interface. “lighttable” and “darkroom” are the menus you will be using most frequent. 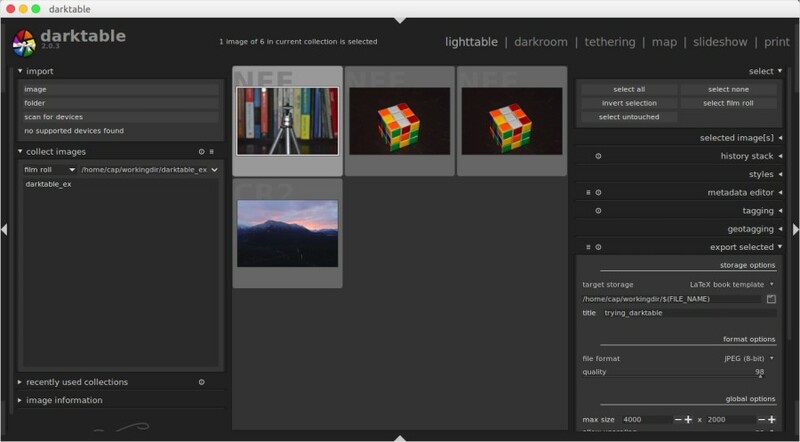 You will use the “lighttable” menu to manage image library, while the “darkroom” menu is used to perform image editing and ajustments. This tutorial will be focusing on those two menus. Let’s start this Darktable tutorial by importing photos. Assuming that you have installed Darktable on your computer, the first thing you need to do before getting started to work is obviously to take the photos you want to manage and edit to Darktable. On the lighttable mode, you will see a menu called “import”. 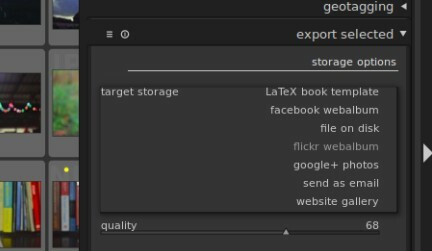 You can use this menu to import the images you want to manage and also edit. 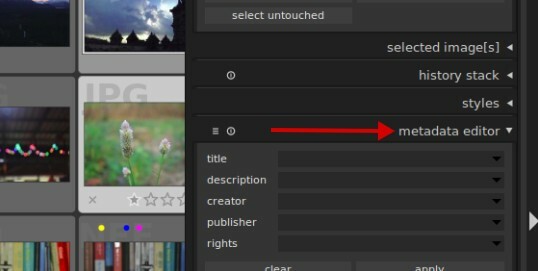 Darktable allows you to import a single file or folder to edit. In addition, you can also import images directly from the recognized cameras by selecting the “scan for devices”. As mentioned, lighttable and darkroom are the menus you will be working under most frequent. To explore the images you have imported to Darktable you can click the “collect images” on the lighttable mode. There are several parameters available to filter the images. This will ease your job in exploring the images you want to work with. If you want to select image on the folders you have imported to Darktable, you can select the parameter of “film roll”. The image themselves will displayed in the center area of Darktable interface. You can set the thumbnail by sliding the handle located right below the image viewer. Always keep mind that a half of Darkable is an image manager. No wonder if the tool comes with a bunch of features to allow you manage your images. If you ever used Lightroom before, then you must already familiar with stars as well as color labels. Those attributes can be used to manage all of the images you have imported to Darktable. As you can see on the step above, you can filter the images by several parameters, including color labels. You will see no image when you select the parameter of “color label” unless you have added the color labels you images. To do so, simply select the images you want to add the color label to and select the color labels which are located right below the image viewer. 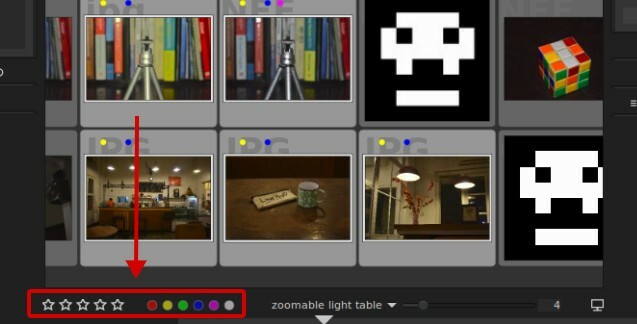 Darkable allows you to add multiple color labels to each image. To select multiple images, you can press and hold the CTRL button on your keyboard while selecting images with your mouse. In order to make your images be much organized you can also add tags to your images. It’s an additional parameter which will makes it easy for you to find your images with certain keywords. For instance, if you often take landscape photos then you can tag the landscape photos you have taken with something like “landscape”. To add tags to the images, you can click the “tagging” menu on the right panel. Select images you want to add the tag to and hit the enter button. You can also add multiple tags at once by separating them with comma. Once you added the tags, you will see the tags you have added when selecting “tag” parameter on the “collect images” menu when you are exploring your images. The default metadata generated by a digital camera is limited enough. If you want, you can also add additional information to your images. For instance, if you often give your images away via the internet, you can add the CC0 licence information to your images. Or, you may want to tell everyone who uses your photos that you are the man who created them. If so, you can add your name on the creator field on the metadata editor of Darkable. 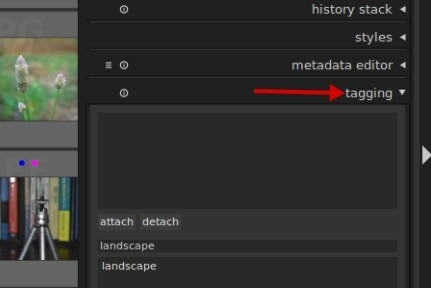 The “metadata editor” can be found on the right panel of the lighttable mode. As mentioned, all the adjustments and editings you made to your images won’t really be applied until you export your images. You will still be on the lighttable mode to export the image. Darktable allows you to select multiple images at once to be exported. The interesting one from Dartable is that it allows you to select several target storages. From local disk on your computer, Google Photos, Flickr, Facebook and even email. 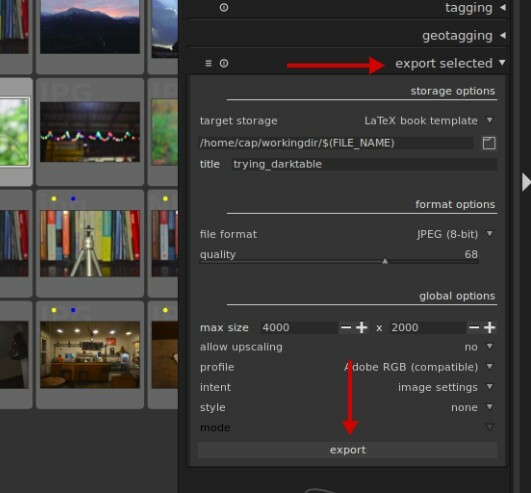 To start exporting images, you can click the “export selected” menu on the right panel of the lighttable mode. There are several parameters you can select. The “export” button itself is located at the bottom of the panel after you have activated the “export selected” menu. In addition to managing your images, Darktable can also be used to edit them. More specifically, Darktable is designed to work with RAW files (much like Lightroom), although you can also use it to edit JPG files. You can use Darktable to fix certain issues regarding the photos you took. For instance if your photos are under exposure, you can fix them by increasing the brightness as well as other adjustments to make the photos look decent. To make the adjustments, you can go the darkroom mode by double-clicking certain image you want to make the adjustment of. Or, you can also go the darkroom mode by clicking the “darkroom” menu. On the darkroom mode, you will see several menus on the right panel. All of these menus are used to make adjustments (exposure, white balance and so on) and basic editing like cropping the images and rotating. You can click on each menu title to expand all of the adjustments you can make as well as the editing tools available on each menu. Just for an example, if you switch to the “tone group” tab, you will see the options to adjust image tones. There are so much adjustments you can make in Darktable, which is impossible to write them in this article. You can explore what kind of adjustments you can make in Darktable by switching between the tabs on the darkroom mode. The basic editing tool, like crop and rotate, can be found on the “basic group” tab. 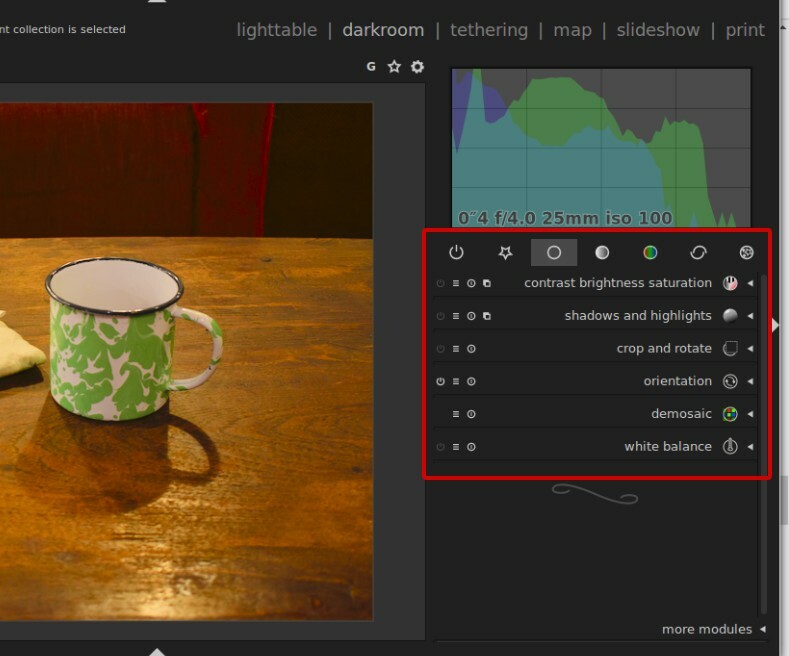 You can see all modules offered by Darktable by clicking the “more modules” menu at bottom-left of on the panel. Next articleIs Gravit Designer Really a Design Tool for the 21st Century?